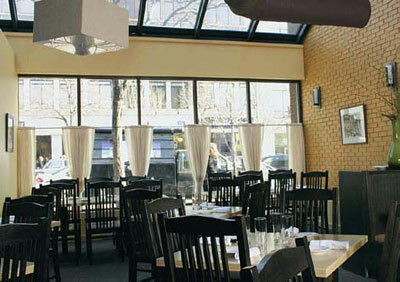 The streetside view from the large, airy dining room at Rendezvous. Thus he gutted the space but kept its most appealing features: skylights and plate-glass windows that allow in loads of natural light. Past them stream an urban visual patois of buses, bike riders, shoppers, and the occasional panhandler. High ceilings with visible ductwork painted black give the space a lofty feel, and the rest of the décor is simple: warm orange, yellow, and red walls set off black chairs and a charcoal carpet. A dungaree-clad Johnson greets guests at the door, and an experienced waitstaff serves us kindly. The food is “Mediterranean-inspired American contemporary,” which, he says, means the chef (Johnson’s longtime friend and colleague Deepak Kaul) “gets to cook whatever he wants.” The menu changes frequently, but features salty/sweet convergences, fruit and game pairings, and a fresh mix of meat, fish, and vegetarian entrées (such as Swiss chard dolmas in a toasted pine-nut sauce). On our visits, we sampled two terrific staple appetizers: the carefully roasted vegetable antipasto ($11) with an earthy North African-style eggplant purée, and the farmhouse cheese plate ($7-$12)—goods from Vermont and France picked by another of Johnson’s friends, Ishan Gurdal of Formaggio’s Kitchen. (More kudos for the chestnut honey and onion-raisin jam garnishes.) The cool cucumber soup ($8), with radishes and mint, packed flavor, but had a slight lumpy texture. Conversely, the gamey richness of the grilled chicken livers ($9) served on a skewer was beautifully complemented by prickly bitter greens, bacon bits, and roasted apricots. The outstanding grilled tuna niçoise plate ($26) held greens, dainty string beans, chick peas, Yukon gold potatoes, and a warm hard-boiled egg (cooked just right)—all accented with an anchovy vinaigrette. A slinky nectarine mostard (a refined chutney) accompanied the pork tenderloin ($24). Slow-cooked over a rack in a wood-fired oven, the meat—exceptionally flavorful and tender—was served over grilled figs and a spattering of port sauce. Rendezvous lacks “architectural-type desserts,” says Johnson. “We do chocolate cakes, custard, tarts.” The delicate lemon-buttermilk pudding ($6) was roused by a sassy huckleberry sauce, and a pear tart Tatin with homemade rum-raisin ice cream ($7) far surpassed any “Dutch Apple Pie” we might’ve obtained at the previous establishment. All in all, we’re very happy to report, we “had it our way” at Rendezvous. And so can you.